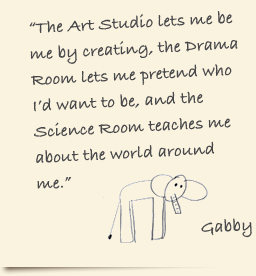 The Art Studio is a place where the imagination becomes reality, a home of creation and self-expression. Here, every child is an artist, and every creation is a masterpiece, representing their own unique vision and talent. The Art Studio facilitator is responsible for ensuring that the room is bursting with supplies for independent art projects, and is home to continuous shelves, filled with usable materials that children can access at their own liberty. The curriculum in the Art Studio includes guided instruction to new materials and techniques, as well as opportunities for individuals and groups to plan and execute their own projects. As with our other rooms, a teacher demonstrates techniques that will teach children about all the possibilities of art, and how to utilize the available materials for the most advantageous results.